Laser inscription of diamonds is a process of using a very fine, precise laser beam to write a customized personal message or certificate number on the outside perimeter of a diamond, called the girdle. The precise heat of a tiny laser beam transforms a very thin layer (just a few atoms thick) of the diamond from transparent carbon crystal (diamond) into opaque carbon (graphite). This gives the inscription a 3D appearance under a microscope. Laser inscription is considered permanent since it can only be removed by a professional diamond cutter. The laser inscription is microscopic -- totally invisible to the naked eye. It can only be seen with a jewelers' 10x magnifying loupe. 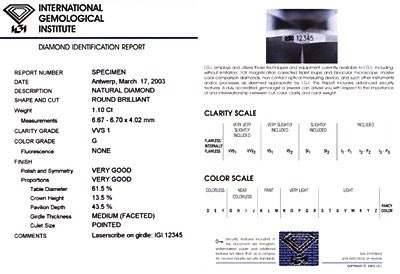 Laser inscription does not change the color grade or clarity grade of a diamond. When you take your diamond ring for setting or repairs, you can identify it and be certain that you receive the same diamond when you return to pick it up. Nothing protects your investment better than the ability to identify your diamond without fail, any time. You will feel better knowing that no one can switch your diamond, whether on purpose or by accident. Some insurance companies appreciate the added security measure this provides. Ask your insurance company about possible discounts on your jewelry rider. We Sell only Laser inscribed GIA, IGI and HRD certified solitaires.